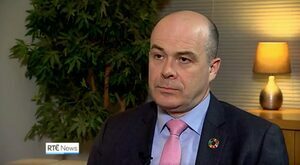 Posted in Misc and tagged Brexit, RTE News, Sean Whelan at 2:52 pm on March 28, 2019 by Bodger. What Do Think Of It, Sofa? 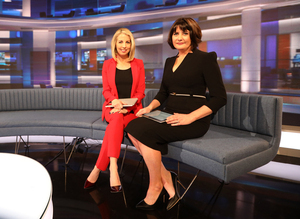 Catriona Perry (above left), Keelin Shanley (above right) and Eillen Dunne (pic 2) help unveil a cheap copy of BBC News/Sky News studio refurbishment and technical upgrade of RTÉ’s main News studio” at a cost €1.4 million. The upgraded studio features a new video wall, 24m long and 3m high, spanning three sides of the studio. It utilises LED technology and a lighting system which is 70% more energy efficient. 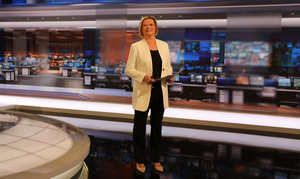 The refurbishment has seen the introduction of new automated HD cameras, a new set design, additional presentation areas and changed opening graphics for the main news bulletins. 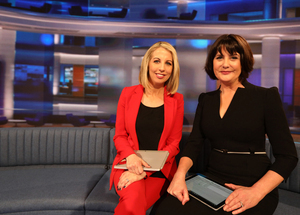 The new look RTÉ News also sees a reworking of the familiar RTÉ News theme music by Irish composer Ronan Hardiman, recorded by the RTÉ National Symphony Orchestra. An innovative and pleasing upgrade. Or derivative, hi-tech, couch-based ‘news’ hub? Posted in Misc and tagged RTE News at 3:10 pm on January 28, 2019 by Bodger. 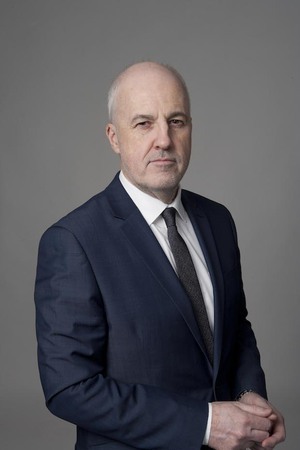 “I take great pride in my work reporting from Leinster House as RTE’s Political Correspondent and especially covering the dramatic 2016 general election and subsequent prolonged government formation process as well as the historic referendums on Marriage Equality and the Eighth Amendment. “I loved every minute reporting on political developments – and providing analysis and context – for RTÉ’s audience. Posted in Misc and tagged Martina Fitzgerald, RTE News at 4:49 pm on December 21, 2018 by Bodger. Posted in Misc and tagged RTE News at 11:15 am on July 5, 2017 by Broadsheet. 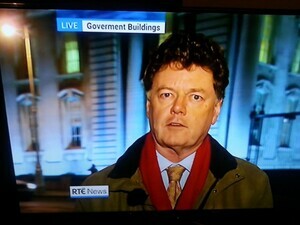 RTÉ News’ John Finnerty this afternoon. Beats wind breaking at least. Posted in Misc and tagged RTE News at 2:28 pm on December 6, 2016 by Broadsheet. 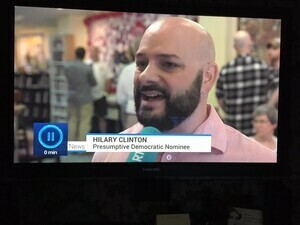 Posted in Misc and tagged Hilary Clinton, RTE News at 8:20 am on June 14, 2016 by Broadsheet. 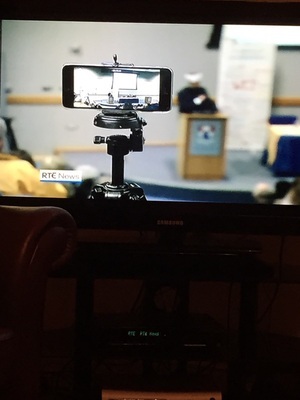 Posted in Misc and tagged iPhone, RTE News at 7:48 am on January 23, 2015 by Broadsheet. 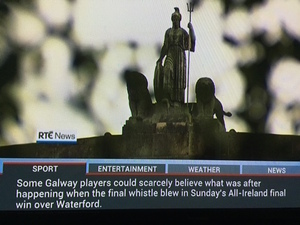 The RTE graphics department strikes again. Posted in Misc and tagged RTE News, typo at 8:55 am on November 26, 2014 by Broadsheet.